(NaturalNews) Health officials are attempting to crack down on a so-called “backyard” cosmetics industry in parts of the Global South, because there are few safeguards in place and they believe their youth are in danger. In Kuala Lumpur, for instance, the New Straits Times reports, health experts are calling for tighter regulations while noting that many of the cosmetics are packed with deadly chemicals which will have adverse effects on “involuntary” users, including children and unborn babies. One of those deadly compounds is mercury, a heavy metal that can be found in many cosmetics products in the third world. These experts are warning that parents who use them—mothers in particular—are inadvertently harming their unborn children, as well as themselves. Too bad these same experts are not warning parents to avoid mercury-containing vaccines. Dr. Mohd Hasni Ja’afar, an environmental health physician and toxicologist at Universiti Kebangsaan Malaysia Medical Center, says children are most at risk because they have a far greater absorption rate—nearly 100 percent—of all chemicals to which they have been exposed, especially mercury. He added that all they do is absorb what is put in and on their bodies, which will create worrying ill-effects in the future. Hasni also said he has real issues with parents who put lipstick and other cosmetics on them, because they are so vulnerable to the toxic heavy metals found in them. “Your children may look adorable and beautiful with lipstick on, but the lips are considered mucous membranes and will absorb whatever chemicals put on [them] at an accelerated rate,” he said, noting further that there should be tighter regulations and stricter monitoring of the cosmetics industry, in part for that reason. The toxicologist said that high levels of mercury are also very common in skin-whitening products, which is culturally accepted in many parts of the world, and as such highly absorbed, even in topical applications. Traces of the heavy metal will not only accumulate in the body’s primary organs, but the mercury is also transferred to an unborn baby, where it is especially damaging to the brain. Among its neurological effects are mental retardation, seizures, vision and hearing loss, speech disorder, memory loss and delayed physical development. Hasni said that with a nearly 80 percent absorption rate, mercury is deposited in the kidneys, in bone matter and in the brain. “The level of absorption also depends on other factors, including age and amount of make-up applied,” he said. “Mercury has a significant effect on babies as their blood-brain barrier — the dynamic interface that separates the brain from the circulatory system and protects the central nervous system from harmful chemicals — is not fully developed,” he said. But again, why aren’t experts concerned about the amount of mercury being injected into babies and small children, in the form of vaccines? The establishment medical industry says that’s not a concern anymore—vaccines are not laden with mercury. But Natural News founder/editor Mike Adams, the Health Ranger, knows better. In June 2014, he published exclusively the results of independent lab testing he conducted himself indicating a “shockingly high level of toxic mercury” in an influenza vaccine manufactured by GlaxoSmithKline. 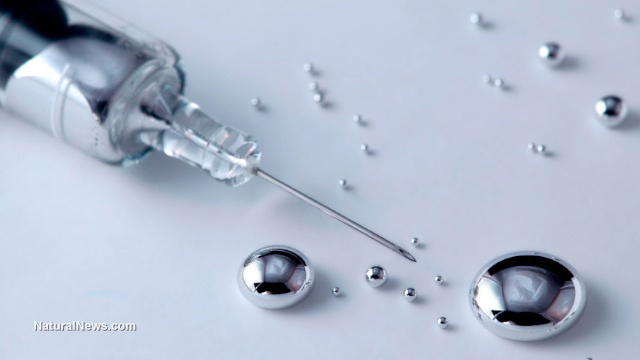 “Tests conducted via ICP-MS document mercury in the Flulaval vaccine at a shocking 51 parts per million, or over 25,000 times higher than the maximum contaminant level of inorganic mercury in drinking water set by the EPA,” he wrote. Vaccine mercury-okay; make up mercury-not so much?